We dreamed of it and then waited for it to happen until finally, it opened its doors, as proud in its past history as it was in its renovation. The Gaité Lyrique is now a year old. And yet, it now seems like it was always there, right in the centre of Paris "exploring digital cultures in all their forms". It has also now been comforted by the success of its visits. Lets take a glance at some of the highlights of an eventful year. In April, Cécile Babiole took over the fourth floor with her "Miniatures", and "Sound Kits" that follow in the line of a performance entitled "Donjon". She began by scanning the Internet in order to collect 3D models of mythical objects before "mistreating" them during performances in order to finally expose them under glass bells. At the Gaîté she shows us minuscule fragments evoking music without worrying about the range in scale, which is variable. 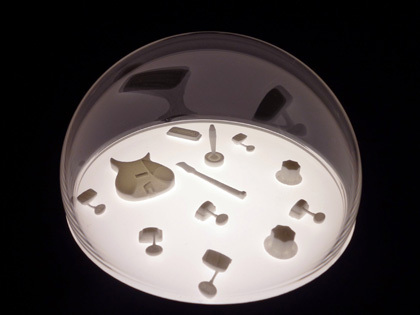 There is a magnifying glass above these assemblages of objects coming from 3D prototypes. Spectators can thus observe these sculptures in detail as they would in front of a painting by Albrecht Altdorfer, because there is an aesthetic of the miniature just as there is an aesthetic of the fragmentary in art. Corresponding to the fragments of objects dismantled by the machine that printed them are the sound fragments that come from the prototypes and which come together harmoniously. Here there is only the question of detail. Miniscule details that form a whole for the greatest aesthetic pleasure. In May, there was a noise coming from the basement of the building, a dull sound that repeated and could be heard all the way to the entrance hall. The sound accompanied the steps of a biped walking slowly but deliberately from the left to the right in a filmed image. It was a creature as supple as its steps were heavy, conceived by Matt Pyke and friends from Universal Everything. Nothing disturbs it in its interminable walk, even the changes of state it goes through alternating from flames to rocks or metal. 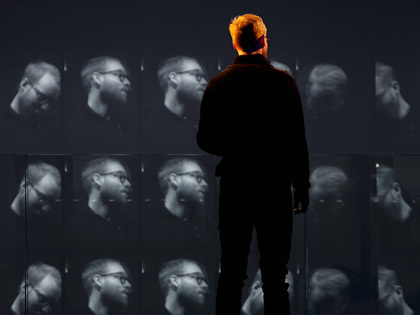 Each of its steps is backed up by sounds that modify the light from behind the image projected in this video installation entitled "The Transfiguration". It is majestic in its slowness and powerful in its regularity in this place that suits it so well, even though it wasn't conceived for this event. 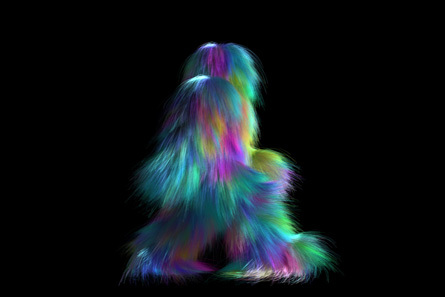 It comes in fact from the broadcast design of a television channel where it is called "Mister Furry". Since then it has lost its faithful companion, changed direction and slowed down. This modification in tempo allowed it to change context, moving from the flux of entertainment to the space of a museum. It is precisely in this kind of in between two things, this infra mince as Duchamp would say, that Jérôme Delormas explores digital cultures. 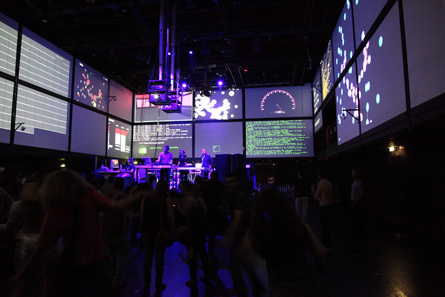 June 2011: The Gaîté became partners with Futur en Seine, which made it possible for Samuel Bianchini to organise his "Discontrol Party". For two consecutive evenings, DJ's played one after the other while the public was invited to actively participate. Those in the room who agreed to, could be localised via RFID (Radio Frequency Identification). On stage, several machines were set up to control the public. All around the room, feedback through images of the computation work of the computers could be seen. Progressively, spectators who came for the music became interested in the images. People take into account their capacity to react. Groups form and the machines resist, but they bend in the end under the pressure. The most diverse digital surveillance mechanisms become as many challenges. There needs to be quite a number to put those that track the crowd to the test, while the video monitor linked to a closed circuit enables more intimate interactions. One can watch oneself dance, as in a mirror, even though one is in the image. It is interesting to note that systems as simple as closed circuit are still functioning, just like the origins of video art. For the return to class in September, Rafael Lozano-Hemmer brought together a dozen of his pieces, the majority of which are interactive. The title of the exhibition "Trackers" raises the mechanisms of video surveillance once again, whereas the powerful rays of light of the installation "Apostasis" seek only absence. 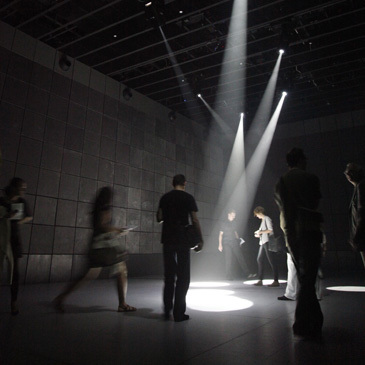 The white discs on the black floor remain immobile until a spectator steps into the light. But the robotised projectors refuse to be followed and flee any presence. What happens then is that one develops strategies to catch these elusive rays of light, by anticipating through prediction as the machines do by gathering vast quantities of information. But nothing works because these "tireless" projectors always manage to find unoccupied zones. The term Apostasis in ancient Greek means keeping away from, but away from what when we aspire more than ever to our few moments of celebrity and are never more than a click away from our friends or community? On Friday, October 7th, the second episode of the Némo Festival 2011 devoted to the Quebecoise digital art scene opened and the main black box of the Gaîté became the rather unexpected theatre of a collaboration between the Montreal performer Herman Kolgen and the Ensemble Intercontemporain. In conceiving "Train Fragments", the Quebec artist took inspiration from "Different Trains" a piece by Steve Reich, a habitué of New York and Los Angeles in the 1940's who might have taken very different trains had he been living in Europe at the time. 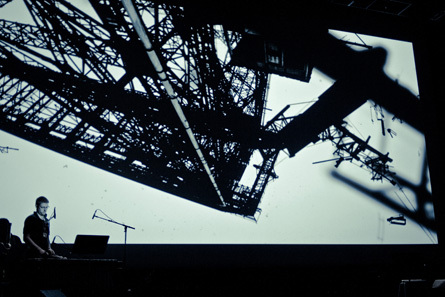 On stage, Herman Kolgen is accompanied by four instrumentalists (percussions, flute, horn and cello) who improvise in response to the video images being projected. We immediately recognise Herman Kolgen's visual universe, in the slowness, in the nuances of gray between blue and green, where virtual elements subtly combine with real images. And then there is this train that transports us, that at the end of its run, dismantles and breaks into fragments. The pieces of metal then slowly become weightless while the musicians also leave the track that was transporting us to participate in slowing down the movement. At the Gaîté, events follow upon one another, but don't resemble one another. So it was the Festival In Famous Caroussel devoted, among other things, to the artistic practices of Circuit Bending that came after Nemo in November 2011. Everything took place on the fourth floor where Benjamin Gaulon set up the third version of "ReFunct Media". It is a work that makes a lot of sense when the French artist, who is based in Dublin, tells us about it. 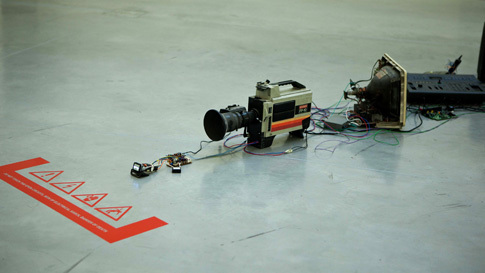 An alignment of low-tech objects bears witness to little experiences accumulated over time. One day, Benjamin had the preposterous idea of connecting the RAM of a Minitel with that of another, just to check out their incapacity to communicate via their channels on their respective screens. Beyond their interconnections, the only common point all these objects have is electronics. It is a kind of electronics comprised of circuits that the artist attempts to put to the test, even going as far as "bending" them. Benjamin therefore refuses to use the instructions that format us while recycling electronics equipment we have parted with. The links he conceives empirically are like unstable hommages to the components of our former daily lives. 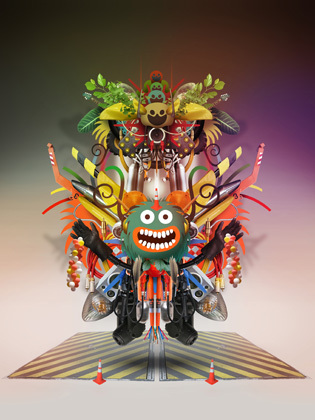 Christmas was approaching and the Gaîté welcomed Pictoplasma. It is rather difficult to qualify this Berlin entity whose activities range from those of an agency to that of a label and on to a festival, given the ease with which it can represent itself visually with characters of all kinds, big or small, by images, by objects or by costumes. And all those around the world who practice character design, as Geneviève Gauckler does, are more or less involved in this movement or trend that consists of imagining, through form, strange beings. Geneviève Gauckler, some of whose work is presented in the exhibition, is an illustrator and manages, whatever her client's activity is, to impose characters that she sometimes stages. In line with the moods of the moment and all quite different, they participate in the production of a graphic work whose unity of style is remarkable. Geneviève Gauckler thus perpetuates the practice of limitless collage by assembling the fragments of photographs with 2D and 3D elements to obtain characters that are often animated by benevolent follies. A propos, what Max Ernst wrote in 1937 is borne out for the digital age: "If plumes make plumage, it is not glue (colle) that makes collage!" And then suddenly, time has sped up because we're already in 2062. It was two centuries ago that La Gaîté Lyrique opened its doors for the first time. But the old clock that still serves as a time machine in the historic foyer was only inaugurated in 2012. It was the era when the artist David Guez introduced this creation by modifying it. Speaking within its immediate environment means adding to its memory as it records everything, much like Andy Warhol did. Technologies have evolved but the idea remains the same: keep all conversations, without judging their value; record all of them because all of them are potentially interesting or will become so. There is, as in a theatre, an ideal position to be in for the machine to recognize and accept us. So we can go back in time by turning the hands from a distance, without even touching them. But when must we stop ourselves to listen to whatever recordings there may be if we haven't left a message in the past? 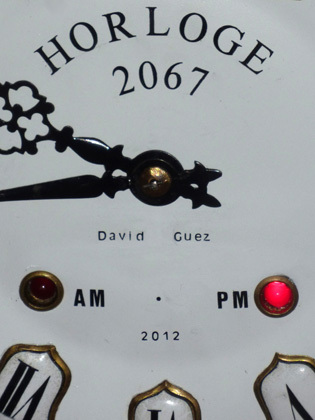 Going back to 2012 would allow us to hear the comments of the public about the event of the moment entitled "2062 Back and forth between the future". By the way: who was the President of France in 2012? But this time machine always comes back to the present moment, because we are in 2062. So, whatever became of "ADM" the entirely autonomous trader the RYbN collective let loose on the Internet? Was it able to invest by anticipating the movements of the financial markets? Written by Dominique Moulon for MediaArtDesign.net and translated by Geoffrey Finch, March 2012.